Summer Hill North neighbourhoods have been waiting, literally waiting to use the intersection of Bathurst Street and Clearmeadow Blvd. due to traffic volume. The wait is so long at times that it pushes cars to use local streets to get out onto Bathurst or over to Yonge Street, or over the Mulock or eagle street. 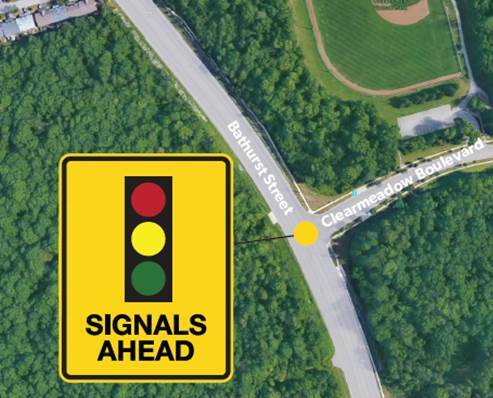 With the recent reconnection of Bathurst Street, even more, cars are travelling on Bathurst Street making it difficult to use the intersection of Clearmeadow Blvd. and Bathurst Street. In December 2017 I asked Regional Councillor Deputy Mayor John Taylor to bring it back to regional staff for review. By March 2018 it was agreed that traffic studies would be performed, and by the end of March it was determined that after three traffic studies during typical operating conditions at the intersection staff at the region have identified that this intersection satisfies the criteria established by the Ministry of Transportation of Ontario and those approved by Regional Council for the installation of traffic signals. Given that the analysis supports traffic signal installation, the project will be recommended to be delivered in 2019, pending budget approval and competing priorities. In interim, staff will begin the design process. This is a very positive change and significate to the safety of the residents. I am very grateful to everyone who worked with me to get this change achieved.